Whenever you look up French music, you’ll always find people mention the oldies. In fact, I find that French-language teachers rarely share cool songs that students want to hear! It’s a shame because listening to music everyday is a great way to improve your French. While the classics are great, I want to listen to more modern stuff. So here’s a list of the top most recent French songs from 2015 and 2016. If you like French music then you can also check our list of top 100 French songs you need to hear at least once. NOTE: we also have a list with Top French music from 2017. Check it out. An anthem for the youth, Nekfeu’s iconic single is filmed in Paris. My favorite part is at 50 seconds. This song reached #14 in France and the album, feu, reached number 3. If you enjoyed this song then you’ll like his other song, Ma Dope. This song has more of a “chill” vibe. The sort of stuff you’ll listen to while rolling around the Périph at one in the morning. The beat drops at 20 seconds with the second verse and the rap by Nekfeu making it awesome. The dashing Kendji Girac won a competition known as the Voice. He later released this hit which was heard across French night clubs throughout the summer. The song reached number 7 in France. The song is an interesting mix of French with a tiny bit of Spanish. Probably one of the most relaxing French songs still played on the radio. You won’t hear this French song in a club, but it’s played on the radio somewhat often. What do you get when you add Booba, auto-tune, and an exotic sports car? This song. A popular club song which makes reference to the TV show “the Fresh Prince of Bellaire” by Will Smith. The chorus mentions Carlton as well as Jeffery the butler – common phrases that French teens would sing to the top of their lungs. In this goofy video we see Keen’v act as a matchmaker to help a guy get the girl he likes. The first time I heard this song, I didn’t care for it. But it grew on me after a couple listens. Another hit by Kendji, reaching #3 in France. Je ne dirai rien – Black M.
Another popular French song by Black M. – you’ll hear this on the radio a lot. Song released October 19, 2015. I’m not a huge fan of this one, but I love his other song Je me Tire. One funny paradox I’ve found with French people is that many of them do not like “modern” French music. While French music is common in France, many French people wind up listening to American music… You’ll hear tons of Top 40 hits from the USA. A popular American song can rack up BILLIONS of views on YouTube while popular French songs barely break 100 million views. So with your help, we can make French music more popular. Feel free to share this list and add some French music to your day! If you think any other songs deserve to be on this list of French songs that were popular in 2016, let us know in the comment section below. 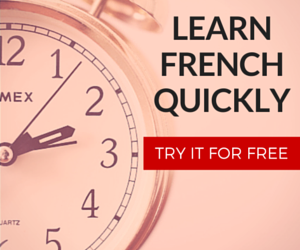 If you’re looking for other ways to improve your French, try Frantastique for a month. Yes I checked from your list :keen V rien q’une fois & cosmos my french students like these 2 songs and repeatedly I play in.my clasfor school students in india one has to take care that each scene is proper & not explicit not any form physical touch….. Please can someone help me find a song? It’s a french pop song I heard when I was on my honeymoon in Paris. I can’t remember the name of it but it had a clapping during the chorus and was set in a care home and they all ended up dancing. Something called ‘Buenos Aires’ or something like that. Two male singers with mustaches I believe. I like Nessa ‘je suis la’. Heard it whilst I was learning French. Is she from France? I’m taking french 1 right now, we had a project on french songs. This helped very much!! Ty!! Some french songs, i don’t know what kind of music you like then i took many style of music. Kevin Bazinet – Jusqu’où tu m’aimes. Could you tell, which of the songs from your list came out approx.end of2015-mid2016? Did You Recognize Her ? Everything by Patrick Fiori. The most beautiful voice of all! And he can sing everything from opera to rock. The reason you won’t find them here is because both Mae and Zaz have not produced popular music during 2015 and 2016. The last Christophe Mae song I enjoy listening to came out back in 2010!! Don’t fret though! You’ll find Christophe Mae and Zaz both in my Top 100 French songs playlist. Ah bon ? I’ll have to give it a listen ! !